Pet Breeder Erin, who can be found in Megalopolis Shop, can fuse two of your pets together, which means you will end up with one pet that contains the stats of a pet of your choice, and the image of a pet of your choice. First, you’ll need a pet which’ stats you’d like to use, and a pet which’ image you’d like to use. 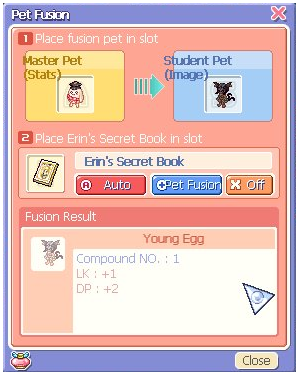 Second, you’ll need Erin’s Secret Book, which can be purchased from MyShop for 1800 points. In the yellow square, you put the pet which’ stats you’d like to use. The pet which’ looks you’d like to use goes in the blue square. Fusion Result shows you what you’ll get when you fuse the pets together. This is basically a confirmation for you.